Agilent Technologies have introduced the first set of digital-video measurement applications for their X-Series signal analysers. 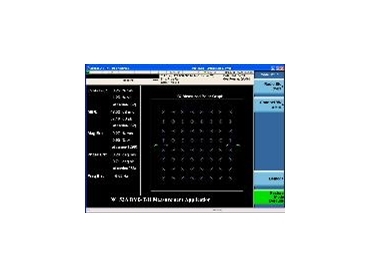 The Digital Video Broadcasting-Terrestrial/Handheld (DVB-T/H) and Digital Terrestrial Multimedia Broadcasting (DTMB) measurement applications provide one-button, standard-based power and modulation analysis capabilities to help broadcasting and digital video customers design, evaluate and manufacture DVB-T/H and DTMB modulators, transmitters, amplifiers, tuners and gap fillers/repeaters. DVB-T/H is the European-consortium standard for broadcast transmission of digital terrestrial/handheld television. DTMB is the broadcasting standard for Chinese national terrestrial digital TV. The complexity of each standard demands flexible and accurate modulation analysis for system development and evaluation. Agilent Technologies’ DVB-T/H and DTMB measurement applications work with the X-Series analysers to provide a more complete picture of DVB-T/H and DTMB signal problems and their causes for better design troubleshooting. The speed of Agilent Technologies’ X-Series analysers ensures the resulting measurements on transmitter/modulators and components are not only accurate, but also fast. The DVB-T/H and DTMB measurement applications feature easy-to-use, standard-compliant DVB-T/H and DTMB power and modulation analysis measurements for the MXA and EXA X-Series signal analysers. Running on the X-Series analysers, the measurement applications allow users to access functionality that extends beyond digital video (phase noise, noise figure and cellular communications formats). Users have access to RF power measurements, spectrum emissions mask, digital demodulation, and general spectrum analysis in one analyser thereby simplifying the DVB-T/H and DTMB system development and manufacturing analysis. The ability to use the measurement applications with either the MXA or EXA signal analyser each at a different price point, but with the same user interface provides the user with the flexibility in addressing a wide range of applications, performance and budgetary needs. Agilent Technologies’ DVB-T/H and DTMB measurement applications contain user-friendly features (auto detect and ‘PASS/FAIL’ indicator support) specifically designed for more convenient use in R&D, manufacturing and performance test. Along with an intuitive user interface, these features expedite troubleshooting and design verification. Other key benefits of Agilent Technologies’ DVB-T/H and DTMB measurement applications include increased reliability and SCPI command support, which help streamline manufacturing processes. An optional RF or analogue IQ input (only available in the MXA) increases the measurement flexibility. Agilent Technologies’ X-Series signal analysers feature the MXA and EXA solutions. The MXA is a fast and accurate mid-range signal analyser.